TLC will headline the original throwback event of the summer, 90s FEST! The iconic R&B group has just released a new self-titled album and has sold over 65 million records worldwide with hits including “Waterfalls” and “Creep” along with accolades including four multi-platinum albums and nine top-ten hits on the Billboard Hot 100. 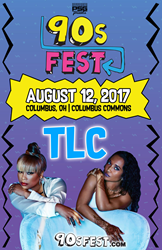 TLC is headlining 90's Fest in Columbus on August 12, 2017. ... a totally engrossing time warp through music, fashion and activities. 90sFest is the only event of its kind bringing the best of 90's music, food, fashion, and (Dirty) Pop culture. It's more than a revival concert; it's a totally immersive, time-traveling experience. The event is packed with some of the best musical acts of the 90's. Grammy award winning group Blackstreet brings “No Diggity” (and no doubt a high-energy Hip Hop performance) to 90's FEST Columbus. The group has worked with everyone in the industry from Dr. Dre to Eve and even Jay-Z. Chart toppers C+C Music Factory and 17th Floor add to the bill while bringing some serious funk and timeless fads to the festival along with DJ Suga Ray, who will be spinning all evening! Columbus Alive called last year’s 90s FEST at Columbus Commons “a totally engrossing time warp through music, fashion and activities.” The event returns August 12, 2017 with fervor, fandom and tons of Furbies (the iconic 90s toy)! 90s FEST brings the best decade of fashion, music and pop culture to Ohio for a full out experience that mimics everything you loved as a child. General Admission ticketing starts at $25, VIP for $55. Prices will go up when additional musical guests are announced (soon). The event runs from 4 PM to 11 PM with numerous food, beverage and merchandise vendors! To stay up-to-date on all things 90s, visit 90sFest.com and follow @90sFest on social media! About Prime Social GroupGet an in-depth look at this up and coming Ohio based promotions and entertainment company.